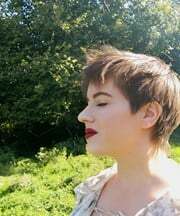 I'm very new to this, but having read some of the other lovely planning threads, stories and advice I thought it would be nice to try my own! We have been together for 6 years, after meeting at conservatoire (we are both professional musicians). We'd actually been in the same youth orchestras since we were about 13, and I had always heard how lovely he is, but we never spoke! We ended up at the same conservatoire (music college/ university equivalent) and got together after a drunken evening of dancing at the summer ball at the end of our first year! 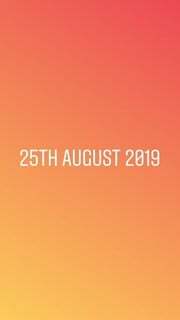 We went on a date a week later and have been together ever since, and now will get married on 3 August 2019. We're now professional musicians (I'm a cellist and he is an extremely talanted vibraphonist/percussionist) and somehow trying to save up for a wedding on a freelance musicians income! Any pieces of advice for ways to cut costs and still have a beautiful day are very welcome! Especially anything crafty/artsy as I'd love it to be quite homemade and any excuse for a day of art /glitter would go down well with me and my mum! I'll gradually let you know how things are going and would love to hear all about yours too! 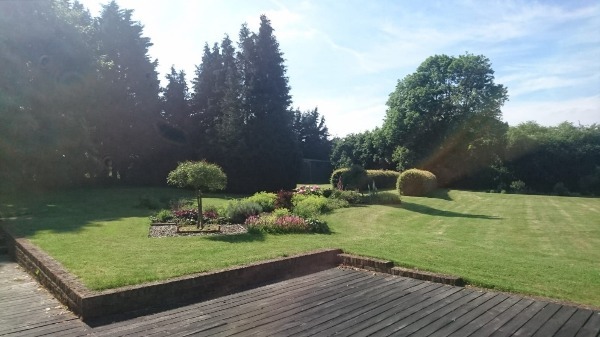 As our budget is on the (very) low side, I was very concerned about venues, but I am extremely lucky that my grandparents have a very beautiful house with a massive garden, and they immediately suggested that we have our reception in the garden! As you can see, ample space for a marquee! I will write about our marquee dilemma soon, but for now, we knew this is a good starting point! It's beautiful, although not as glamorous as many formal wedding venues, but as we want a relaxed day it seems perfect! However, we can't have the ceremony there (unless we paid a ridiculous amount for a 3 year license for it!) And so we had to look elsewhere. 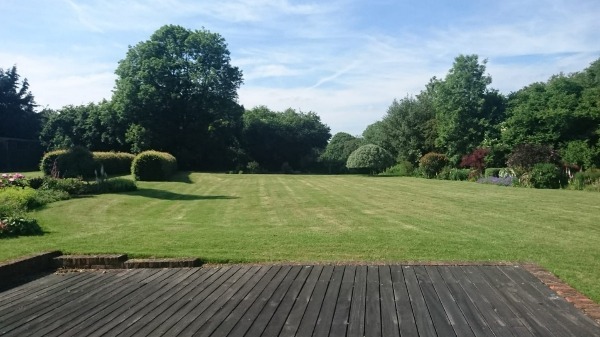 The place we have decided on is about 25 minutes drive away (which we'll have to tackle when it comes to travel options! ), but it's pretty and very budget-friendly. 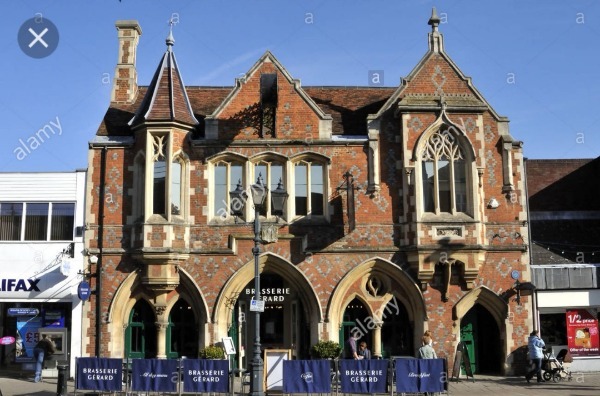 We chose Berkhamsted Town Hall, as they were very friendly and flexible, the room is very pretty and they have a baby grand piano, which is perfect as my heart is set on the two other members of my trio playing piano and violin as I walk down the aisle!The outside is on the high street, and unfortunately has a restaurant underneath, but it's nice looking. The room inside can easily seat our 100 guests, and has a nice long aisle for my 8 bridesmaids to walk down! These images were all from Google! The red seats don't quite work with our colour scheme, but covering up chairs is not high on our priority list and we don't have the budget to address details like that! They won't clash horribly as there is no pale pink or anything like that. We are currently wondering about minimal decorations. They have two nice Grecian-style plynths ,and we are considering possibly having those with little olive trees on at the end of the aisle on either side, and some scattered rose petals and perhaps candles down the aisle? My dress is big so I'm worried I'd catch them so if anybody has any bright ideas about solutions for that, or simple decor advice for a simple service I would love to hear from you! The proposal was lovely, he did so well! I'd known about the ring for ages, as his cover story was pretty terrible! 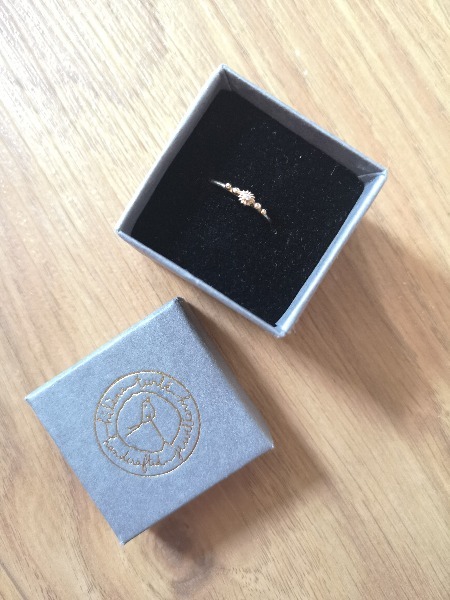 When the ring arrived (or didn't arrive!) I was at home and he was away, but had a notification that it had been delivered and had a panic when I said nothing had turned up! He tried to dismiss this mysterious parcel as a gadget from Amazon but he did a pretty terrible job of lying and so I worked out what it was! It turned out to be at the post depot, so everything was fine. He knew what rings I liked (from a company called HLSK in Australia) and he chose one I hadn't seen , but is absolutely perfect for me! It has a blue topaz as diamonds were out of budget, and I also wanted something slightly different! 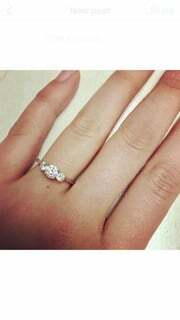 However, he ended up proposing without the ring as he left it in the UK! He had a gig at the Winter Jazz Festival in New York, and we decided to split the cost of another ticket so that I could come too (his travel was free) and stay an extra three or four days! 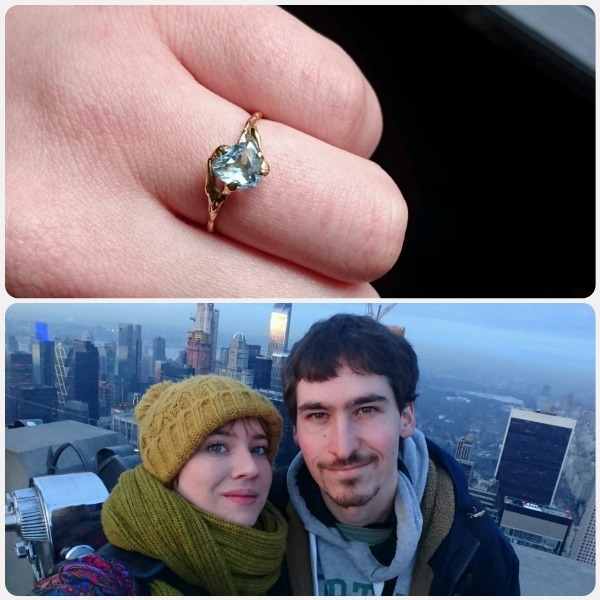 I didnt think he had the ring as he allowed me to get things from his rucksack and we were sharing a suitcase. So the day after his gig (in January) we did some sightseeing and we decided to go up the Rockefeller Center to watch the sunset on Top of the Rock! Luckily it was a beautiful day and the sunset was hazy and gorgeous! He seemed a little stressed and eventually wanted to find a quiet corner (I was madly hoping but trying not to be too excited!). When we found some quiet, he took my hand and said that I was right, he accidentally left the ring in the UK ,but did it matter? And I said of course not! So he asked me to marry him and of course I said yes! It was actually perfect, because if he'd had the ring and gone down on one knee everyone would have seen and clapped and cheered and I would have absolutely hated it! So it was quiet and beautiful and sweet and it made me so unbelievably happy that I couldn't stop smiling! When we got down to street level we called our parents and sisters and everyone got very excited! Me with my H2B, Ralph, with a snowy Central Park in the background! I completely surprised myself when it came to my dress. It was a funny process! Before I got engaged, I went shopping with my mum around my birthday, and we just happened to see a beautiful dress in the brand section of Topshop in London. It was too much for a birthday present but we loved it so we decided I should try it on anyway, for fun! 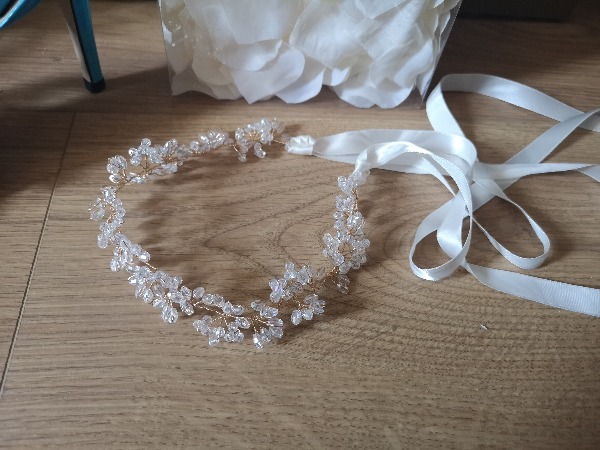 Once I did, it was so beautiful that my mum said she would buy it for me and then I could wear it for my wedding one day! So I agreed, and we got it. It was very pretty, a white overlay with multicoloured flowers, and not too traditional which I liked (or so I thought). Anyway, I had this dress in my wardrobe, a year or so later he proposed and I thought ''ah great, I already have a dress so I don't need to worry about that!" . I then asked my best friends and sisters/futureSIL to be my bridesmaids and told them they could choose whatever they want within the colour scheme, as I want them to be comfortable and feel themselves and get something they might wear again! 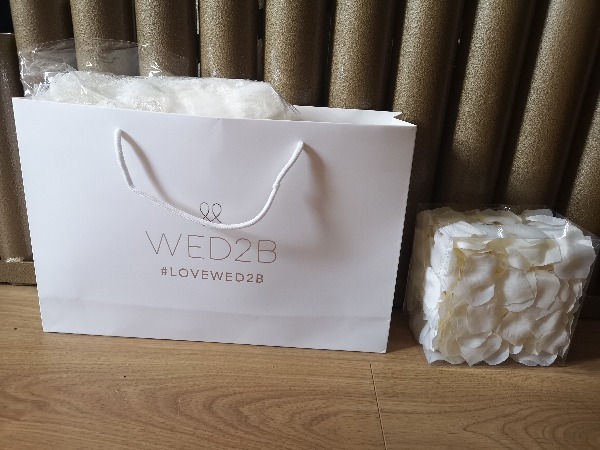 This was all fantastic until they started finding amazing bargains and beautiful dresses that were more formal and striking than mine, and I began to feel that while mine was pretty, it wouldn't have much impact after my gorgeous bridesmaids! I went shopping with my sister for a dress for music recitals (one of the fun bits about being a performer!) and we had walked around the whole of Debenhams and were idling around waiting for my mum to meet us when she suggested we look at the bridal boutique. I took some persuading and eventually walked over with her and decided to browse. 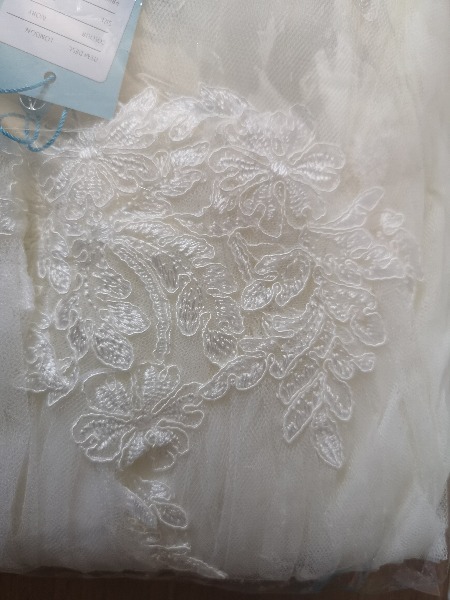 There were lots of beautiful dresses but nothing at all that I felt was right for me or better than the dress I had, until the last one at the end of the sample sale rail, literally the last dress I looked at in the boutique. I pulled it out and fell in love! I practically ran into the dressing rooms and came out absolutely beaming and unable to stop swooshing the skirt around like a child! However, it was £650 (not much for a wedding dress I know, but a lot for me and considering I hadn't budgeted for one!). My mum turned up at this point and loved it too. I got very emotional and called up my H2B, hoping he would either talk me into it or out of it, but just help me in some way as I was very conflicted! It's a lot of money for us and I didn't know what to do. As I was explaining this on the phone (and fighting against the sensible advice I'd hoped for) I heard 'CONGRATULATIONS!!' from the counter and looked over to see my mum and the saleswoman beaming; my mum had quietly bought it for me! 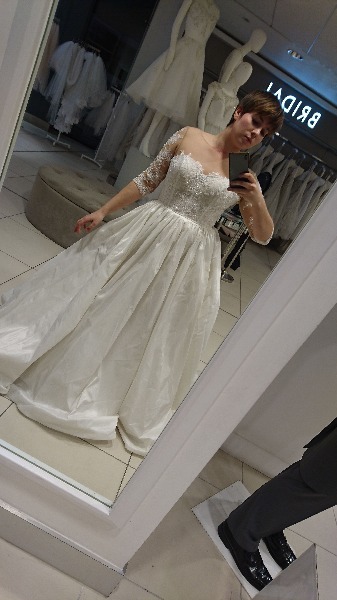 I got off the phone and burst into tears and now I have the most beautiful dress!! And much more traditional than I expected for myself! 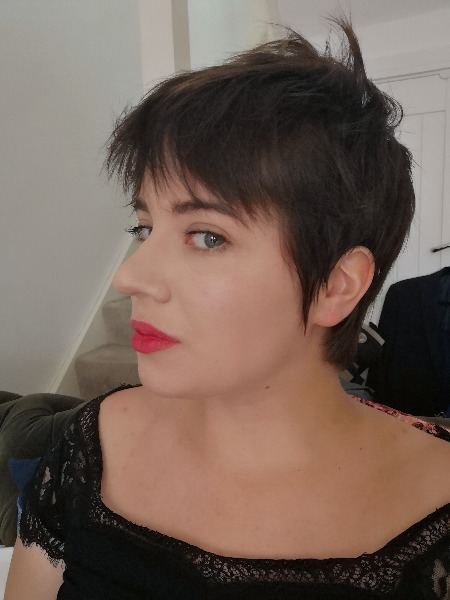 I still may change into the other one part way through the reception as it's big and I might want to wear something lighter in the evening, but here it is! I couldn't be happier with it! I love the crumply skirt, I can't stop playing with it when I wear it! It is a tiny tiny bit too small and the zipper doesn't quiiiite donup but I am on a diet and I have a year to fit into it so am not worried! I would like to come down one dress size at least! Bye bye puddings 😔! I was very stuck with bridesmaids originally as I didn't want to have too many, but I ended up asking 8 because I couldn't choose between them! That includes my two sisters, my future SIL, and five friends from different parts of my life/growing up! It was very hard to choose a MOH and I was considering not having one, but I realised I would feel guilty if I didn't ask this particular friend, and when I did ask her she laughed and told me she'd have assumed it anyway, which didn't at all surprise me! So I was glad I'd made that choice! I love her so much and she's crazy and will produce a brilliant MOH speech I'm sure! They're all completely different personalities, styles and sizes, so I felt it would be ridiculous to ask them to wear the same thing! Most of them would be uncomfortable, they'd never wear the dresses again ,and most importantly I asked them to be my bridesmaids because I love them for them! So I have given them a vague colour scheme of misty sea colours (Greys, teals, lavender grey, aquas) in the hopes that they can all find a colour they like within it and something they'll want to use again. I think they'll be gorgeous together, and I think a pale sea green and some deep greens / teals will probably be the remaining choices! Firstly, my shoes! I thought it might be nice it they were my something blue, and I wasn't a fan of any of the bridal shoes I'd found. I normally like clumpy boots or ridiculous sparkly things, so I was worried about finding something tasteful! 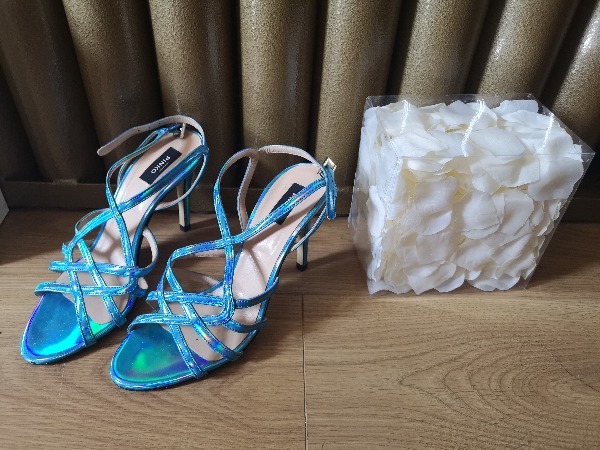 But a bridesmaid took me shopping in Chiswick and we went into various charity shops and in one I found a pair of shoes that blew me away! They're Pinko, and only worn once, and I got them for £50 which I thought was a pretty good deal! I love that I'll have managed to get a good boost of me into my outfit as I am normally ridiculously colourful! 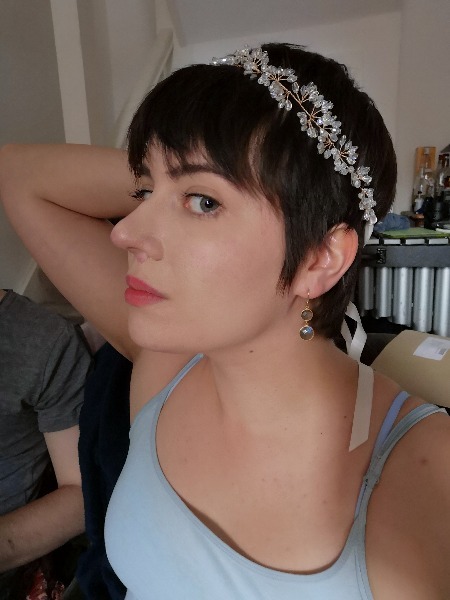 For my hair, I found a beautiful hairband for £20 in Aldo of all places! Another bridesmaid had dragged me in and spent about 50 minutes trying on many shoes that looked basically the same to me so I wondered around and looked at every single thing in the shop, and found the wedding accessories right at the bottom in a corner, and thought this happened to be beautiful! I wasn't going to wear a veil, because my H2B said he didn't like them. I've always thought they were beautiful and I was feeling pretty disappointed until I realised what he didn't like we're puffy ones that went over your face! So my mum and I went to wed2b and had a look at them and one stood out as being particularly gorgeous. 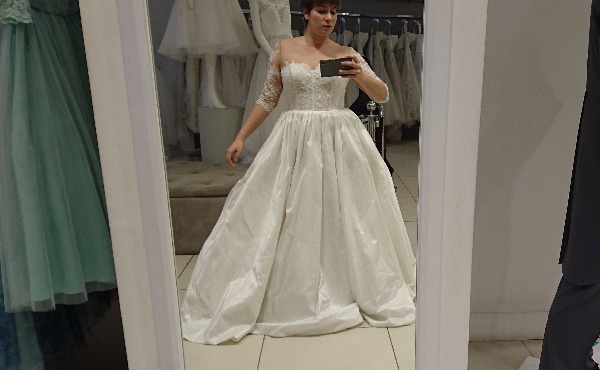 They very kindly let me try it on with my dress (not from their shop) and it was gorgeous! I forgot to take a picture with it on, but I found it online and have a picture of it in its packaging. It was £119 and my lovely mum insisted on buying it for me! 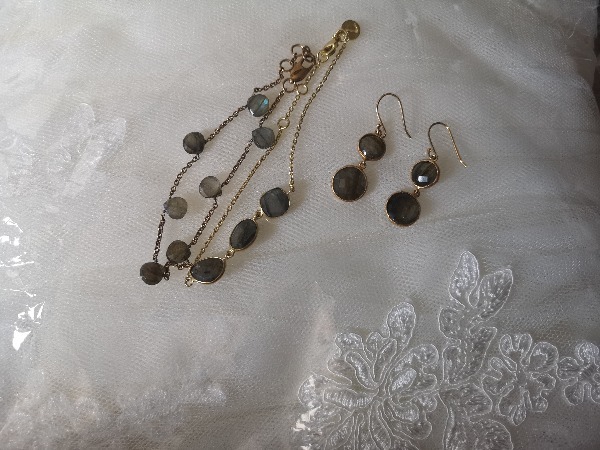 Jewellery wise, I wanted to wear a particular bracelet as my mum bought it for me and I just love labradorite, which also fits in well with my gloomy sea colours! So I am planning on two bracelets, the one she bought and another I bought in Accessorize soon after, and a pair of earrings that I found in TKMaxx for £14! And finally my ring! I went to a craft exhibition with my mum and sister in Canary Wharf and found a stall by Héléne Turbé, a jewellery designer from France and I fell in love with her work! Unfortunately they were mostly way over our small budget, but I found one which was incredibly delicate and light, and fit perfectly with my engagement ring! 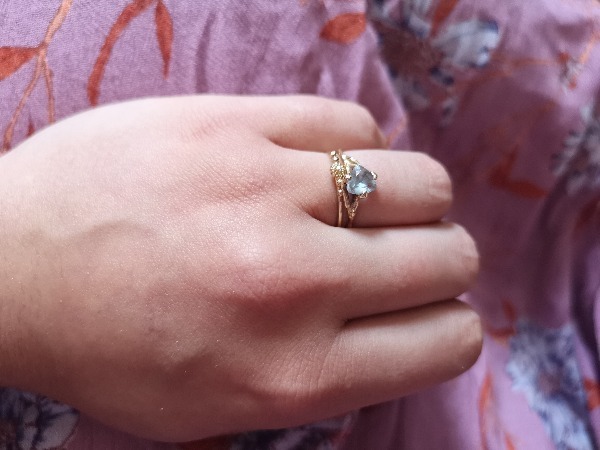 I have to be careful as I had to get rings delicate enough that my hand doesn't feel different when I play the cello/affect the way I play, so I feel very lucky to have found one I liked so much and that I will still be able to wear with my engagement ring! I really recommend having a look at her work, her rings are absolutely gorgeous! I love your engagement ring! It's s pretty and unusual - I love blue. I also think that your grandparents' house looks so beautiful! One of my pipe dreams because I was worried about catering was having a kind of "guests bring your own dish" type buffet/meal but this was not at all feasible with our venue. Might work with yours though and help save money? Thank you! It's a great company and they do some beautiful opal ones and things like that but opals are more easily damaged so we decided for a ring I'd wear all the time they may not be the best idea! Yes I love that idea! We've actually sorted out main meal (I'll write a post about it soon, we really wanted curry!) but I think I'll do that for desserts! I love the idea of people bringing a cake or pavlova or something like that and having a big spread of different things that people love to make! The one thing we had decided before we got engaged was that we wanted curry at our wedding! We eat so much of it, and we discovered one of our favourite restaurants caters for weddings and events! It's called The Coriander, in Amersham although they have some sister restaurants dotted around! We had a meeting with them the other day and the current plan is bajis with chutney and pickles as a sort of canape, and then we chose a few main dishes to have as a buffet. The current plan is: Chicken Masala, Lamb Palak, Prawn Dopiaza, Paneer Korai and Vegetable Dhansak, with Pilau Rice and Garlic Naans! We are debating a bit as we don't eat much meat and didn't necessarily want both chicken and lamb, but while we wait for the updated quote we're mulling it over! We also realised there are a few people with dietary requirements and the resraurest can't cater for that, but my mum makes a wonderful dahl-type thing so I think I will ask her for a big pot of that, vegan / gluten free! For desserts, as Mrs P 2019 suggested, we're thinking of a dessert buffet! I would ask various relatives and any friends who would like to to bring a dessert or two that they particularly like to make/eat! I know for example my granny makes really wonderful trifles and cheesecakes, and I would love to make some tropical fruit pavlovas! I love the idea of a huge table of yummy desserts and fruit and deliciousness and I think it would look lovely too! This is one of the things I am most excited about! Nothing is finalised yet, but Ralph's godmother Aunty Wendy is making it and my mum (who is an artist) will be decorating it with my assistance! I think it will probably be a jumble of different tiers both flavour wise and visually! Ralph is adamant we must have a fruit cake as he loves Aunty Wendy's fruit cake! I am determined that one tier is spiced plum and vanilla marscapone as that is my favourite! I think we should probably have a chocolate tier (my sister would probably never speak to me again if we didn't!) And perhaps some sort of elderflower or orange blossom or something light and floral and summery. And a separate one that is gluten free/vegan etc! So it's going to be quite eclectic and dramatic and I can't wait to figure it out! I love that it will be made by our families and ourselves, and hopefully will be very unique! I'm loving all of your planning so far. You have such a similar colour scheme to us. Were also doing moody sea colours but with more of a focus on blues. So blues, sea greens, greys and then gold accents. I'm also on a fairly small (in the realm of weddings) budget and love being creative so I plan to do lots of diys and projects. I'm really excited to follow your planning journey. 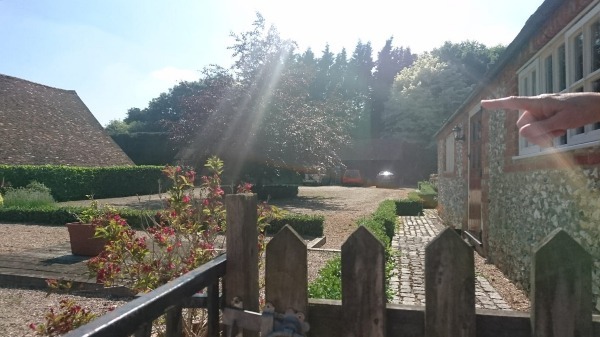 Love your thread- you must live quite close to me too, we are 15 mins from Amersham! Your grandparents house is beautiful and I really like your engagement and wedding rings- so nice to have something different. I'm glad that you liked the idea I am still hoping to get some baking into my wedding, maybe by making the favours though my mum has said I'm crazy to be considering doing something like that which would have to be done near the actual day! Sounds gorgeous! I'm looking to bring in gold accents too, I'd love to see all your colours! Thank you! I just couldn't see myself with a normal diamond engagement ring and a plain wedding band. I went super traditional with my dress and veil which surprised me but for long term things I think they have to reflect me! Yes we're in Chesham! And my grandparents are near Great Missenden/ High Wycombe. Good wedding area, I end up playing cello at lots around here. Everyone has been a bit surprised and said curry is weird for a wedding but a) it's much cheaper a lot of the nice caterers we looked at and b) it's just so tasty and it's very representative of our relationship! The thing that annoys me most about this is the lack of information on pricing that a lot of marquee companies have online. When we were trying to work out an approximate budget, we saw a certain price on a few sites and thought brilliant! Of course what that price doesn't include is stuff like flooring, lighting, draping, delivery, etc. We didn't know much about it so obviously underestimated the cost. It's very pretty.. but for me something just isn't quite right for our relaxed summer evening/garden/ curry buffet. Anyway, I was dutifully doing all my research into local companies when I played at a wedding a couple of weeks ago. 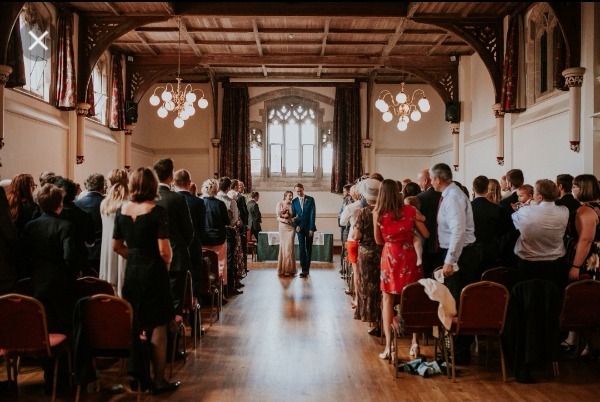 It was one of the disaster days when we had been given the wrong post code, the ceremony was double the length of the schedule we'd been given, I'd thought I lost my handbag, etc. Not the most relaxing of gigs I've ever had! But when I walked into the reception tipis I just fell in love. The other girls playing with me were completely bowled over too. The light is so warm and golden and pretty, the lighting is built in (and it and the flooring is included in the price, hooray!) and it just sets a beautiful atmosphere. The company is called Country Tipis, and there's another similar one called Amazing Tipis. The only thing is that it's a bit more expensive than we'd hoped, but it's so much more us and we're feeling hopeful! We're going to visit one of them next Friday as they set up for another wedding, so that Ralph can see what it's like in person. 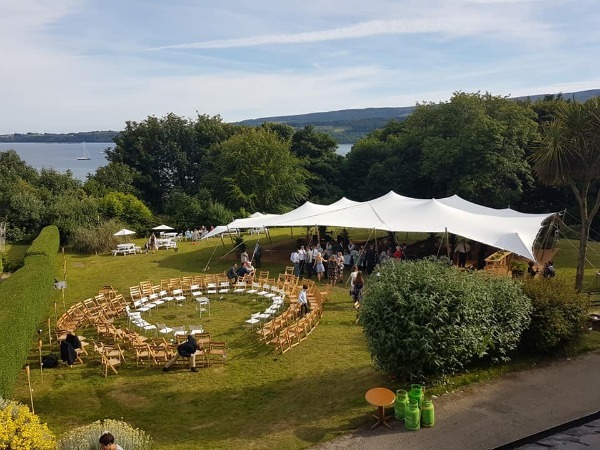 You need 2 to seat 100 guests, I think there were about 160 at this wedding so it won't be quite so big, but the high tipi tops make it feel very spacious and I feel like a hazy summer evening of curry and jazz would be just lovely in these tipis! So cross your fingers for me next Friday and hopefully Ralph will like them as much as he has from the website! Obviously as musicians, this is a very important part of our day! For the ceremony, I'm still not decided exactly which pieces, but I would like the other members of my trio to play as I walk down the aisle. Perhaps some songs from the French composers Debussy, Ravel or even Messiaen, arranged for violin instead of voice. My musical taste is not normally very romantic or wedding appropriate! During the signing of the register I am very tempted to have either a contemporary classical piece for solo accordion by Sorensen and performed by my accordionist, or an arrangement of the finale scene from Benjamin Britten's opera ''A midsummer night's dream' (a musical setting of Shakespeare's play). Orginally this has a boy's cathedral choir and so it would depend on how the arrangement works as some of the magic might be lost. I'm struggling for exit music because I feel it should be happy and I'm not really a happy music person! So we'll see..
For music during food and the drinks reception, I think we'll probably have a big playlist that all the guests can request/contribute something for. But by the time our evening guests arrive, we'll have a collection of wonderful jazz musicians (Ralph is a jazz player) and so the plan is to have a jam session. It'll be fun and provide some really lovely music, played well. The playlist can go back on for later when people are fed up of playing, or maybe we can have a separate dance playlist! I quite like the idea of cheesy music that we danced to in primary school discos! 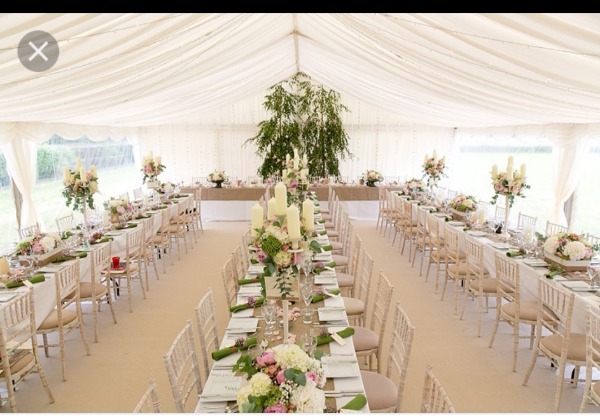 Yes marquees aren't the cheap wedding venue people think they are! 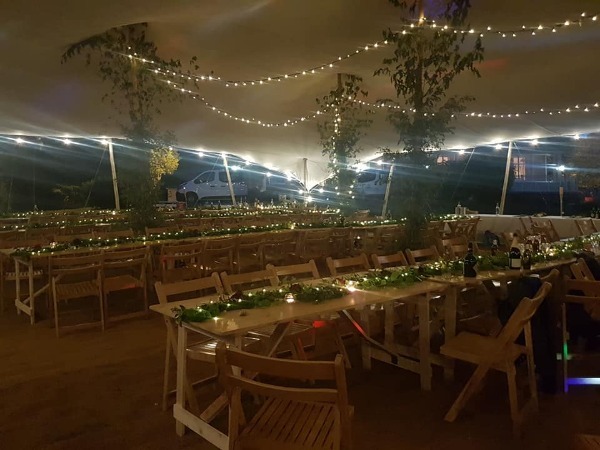 My brother and his wife borrowed a piece of land and the local gardening society's marquee thinking it would be a cheap way to have a wedding. By the time they had hired flooring, dancefloor, generator, bar, tables, chairs, caterer, crockery/cutlery/glassware, portable toilets and all sorts of other things they hadn't thought about it cost them an absolute fortune, more than I'm paying for my wedding venue - and it took them 2 days to set up and a day to take it all down again! The catering was also a nightmare to organise because there was no on site kitchen. 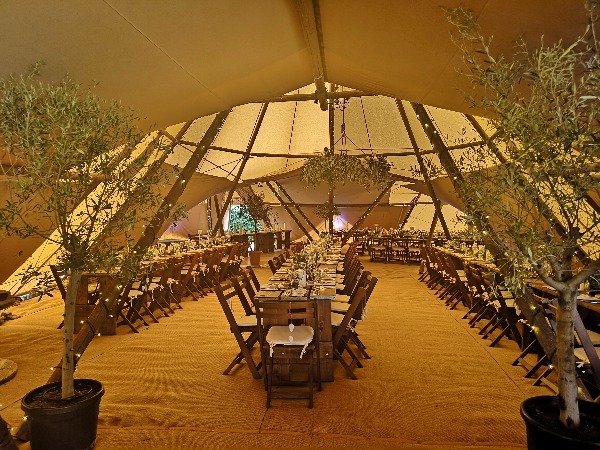 The tipis do look lovely though - just make sure you've budgeted for everything before you commit. Your catering sounds fab, I'm a massive curry fan so would be thrilled with the food at your wedding! Love your planning, and LOVE the curry idea, brilliant! It looks beautiful! I'll definitely look into those if the tipis don't work out, thank you! I love that it would still feel like you're sitting outside.. The weather would concern me though, I don't trust the British weather at all. Yes I am discovering all this eek! However I haven't yet found a venue locally that was as flexible with caterers and that is less expensive. A lot of places I saw and thought were reasonably priced seem to say you had to use their associated caterers etc, who ended up of course being expensive and nothing like what we wanted. I think overall it is still working out as a bit cheaper, just not as much as we'd hoped! My grandparents also already have tables and chairs for more than half of the number of guests we're planning, so that does help cut the cost a bit. It's all so complicated! Unfortunately my heart is set on the tipis and so I'm relying on my H2B to be the rational one! I also spoke to my dad about it all and he said not to worry too much, we can work it out. I'm still going to keep the cost as low as possible though! We are extremely lucky to know a very talented young photographer; as musicians we have to have portraits taken for various things and Becca has taken mine on several occasions. 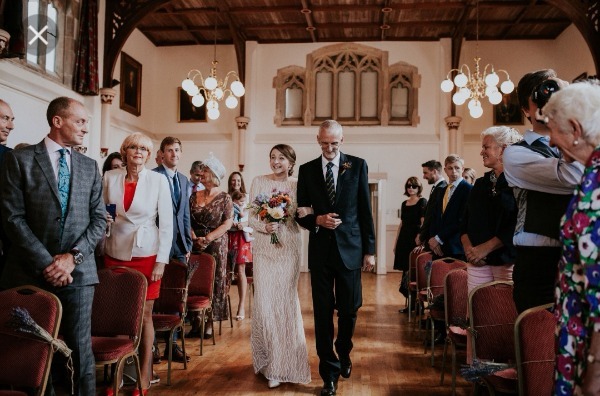 She mostly focused on portraits and photos of bands, bloggers, performers etc, but she has photographed a couple of her friends' weddings and we know she is extremely good, so we asked her and as she doesn't do many weddings the price is amazing (£400) so we've booked her and we're thrilled! I know I have ages before I need to start thinking about this kind of thing.. but I have a couple of days off, Ralph is on tour and so I have a lot of time to think about lots of pretty things! Leading on from the photographer, one thing I absolutely love is a wedding confetti shot. I have seen a few mentions of Dollz Confetti on threads on here and am extremely tempted to include in the budget. We had decided not to have any because there isn't an ideal place for it at our ceremony venue, but now I've discovered this beautiful dried petal confetti, I think that it would make such a beautiful group photograph to have us with everyone throwing it behind! The two types I particularly like aren't quite within the moody greys/teals/sea greens of our colour scheme but I think they'd still look beautiful, and I could maybe sprinkle some down the tables as well to tie it all together! So I'm very tempted! The first blue ones are reasonably close to British sea colours I guess.. The other thing I've got started on is invitations! I won't send these out for a long time, but any craft project means self control goes out of the window, and I wanted to give myself time to experiment and get new things if I didn't like what I came up with! I'm handmaking them, which means they won't be anything like professional ones, but I always handmake my Christmas cards and they tend to go down well with people! (My mum still has hers up from last Christmas as she liked it so much!). It's turned out that I'm pretty pleased with my first attempt, so I've done about 35 already. After a few more I'll have to buy some more cards but as I've got lots of time I'm just enjoying sitting in a cloud of glitter at the moment! I've been using a stamp, ink and embossing powder from Hobbycraft. 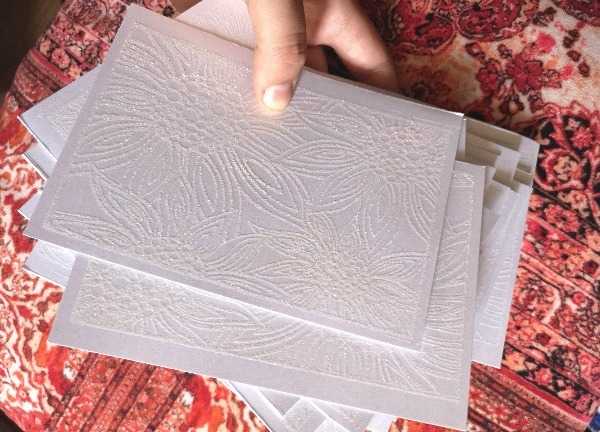 I bought pearly white cards, a pretty flower stamp and white ink, and irridescent powder. 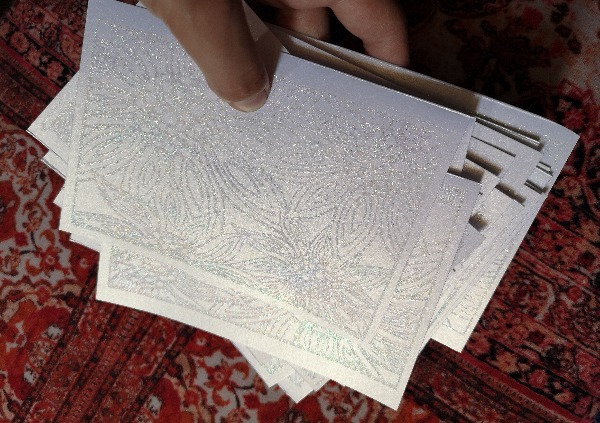 You make the print on the card, sprinkle over the powder, shake off the excess and then blast with a heat fun. The powder reacts (melts?) under the heat and embosses itself to the card. You can see in those that they look different when they catch the light at different angles! The plan is to design something for the writing on the computer and print that out and stick to the other side. Not perfect I know, but so so much cheaper and more fun than ordering the type of thing I'd choose otherwise! I just have to make sure I clear up the glitter by the time Ralph gets back from France tomorrow (it just gets everywhere!). Ralph is not the biggest fan of glitter as it ends up all over his clothes, but it is something he is learning to accept about me over the years! I don't think we started off like that but we're trying to be sensible! Thanks! I'm still a bit worried that people think they're a bit sloppy/homemade but I am quite pleased with the overall effect just my more formal grandparents might think they're a bit slapdash! I'm having so much fun blasting them with a heatgun though. As you can see, not long and wavy and glamorous. So it would need to be some sort of hairband like the one I have or a crown type thing? Anyway we'll see! Britten's Midsummer Night's Dream, Finale (Until the Break of Day). If the violin takes Titania's part (it goes super high) and one sister sings Oberon and one sister takes the choirboy line, and the piano plays the chords underneath and supports some of the melody I think it could be really beautiful! The song I like is from 2 mins 30 . So that but maybe with an English folk song or two from the same composer beforehand would probably make about 8 minutes which I think is right for the signing? Reading wise, Ralph's sister is an amazing poet/ spoken word performer. At his Godfather's funeral she wrote a really beautiful poem and read it out and I think it would be really lovely if we asked her to write one to read during the ceremony (we won't have any other readings I think! I get bored personally). That would mean all sisters will be involved in the ceremony as well as walking down the aisle as my bridesmaids! I love the Luna Bea stuff- equally unsure if I want to spend that much on a hair thing. I think you can rock anything, your hair is gorgeous and would look great with any of those. Looking forward to seeing how music will be incorporated so much into your day, sounds like planning is in full swing!